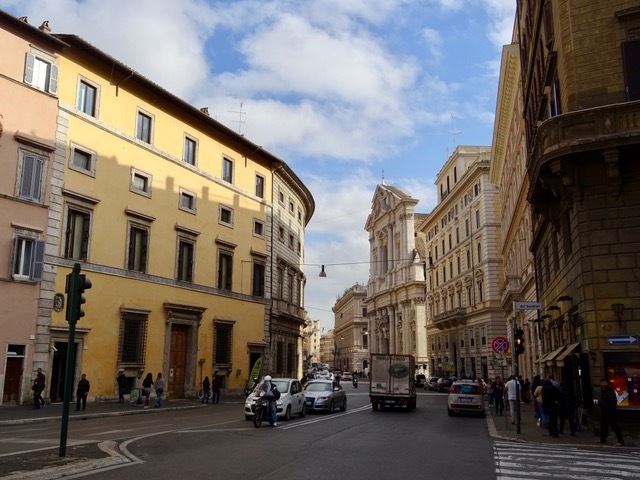 It is a nice day for a walk about the streets of Rome. 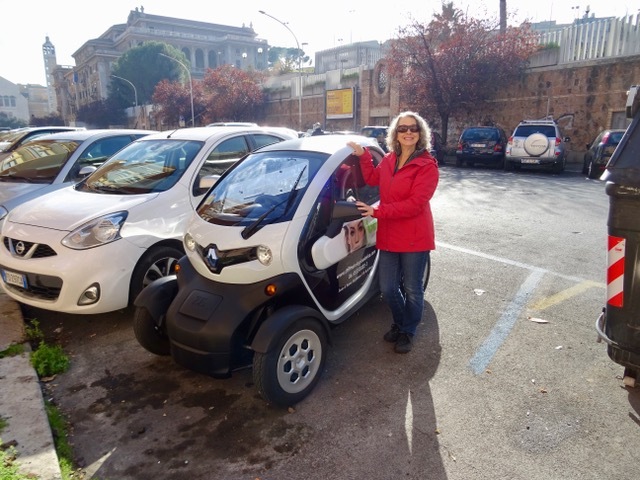 I get my picture taken with this tiny car on the street outside our apartment. It is the smallest car I have ever seen but it sure would be easy to park! We are surprised at how little traffic we have seen on the streets. I think they limit who can drive in the downtown areas. Evening rush hour is busy but the rest of the day not so much. We have tea in Nuovo Piazza. 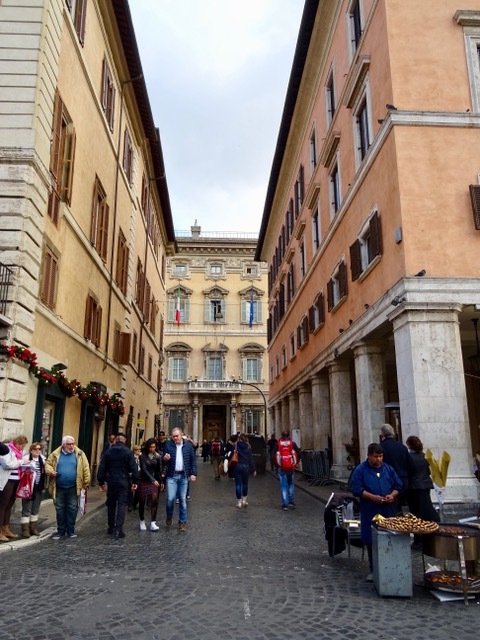 This square used to have chariot races around its perimeter. From 1652 until 1866, when the floor of the square was raised, it was flooded every Saturday and Sunday in August. 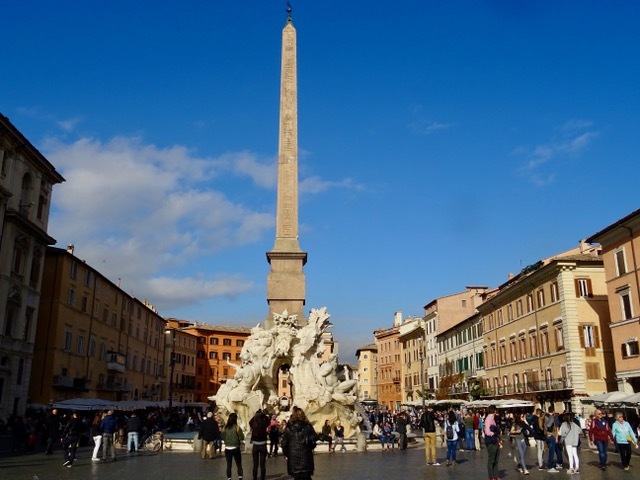 The fountains would be plugged so that they wouldn’t drain and the square would become a lake! I try to imagine the scene, with people boating and bathing and children playing in the water. 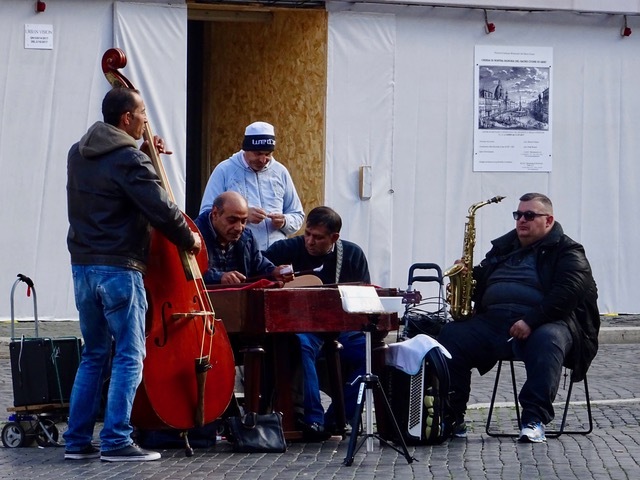 There is a group of musicians who kindly provide us with musical accompaniment. 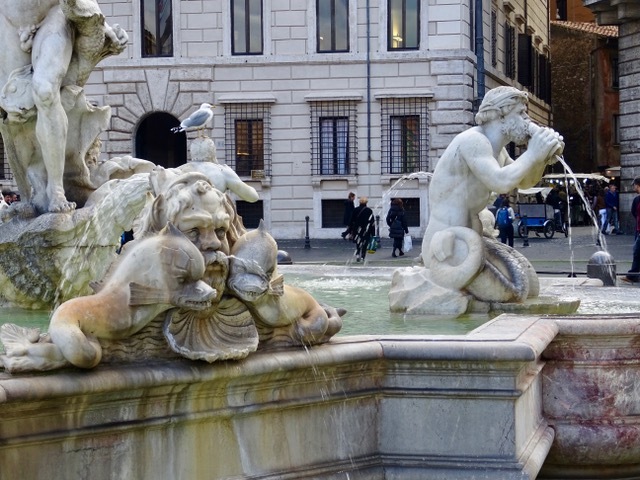 A detail of the Fontana del Moro at the south end of the square. I am going to a life drawing session tonight so we go to check out where it is located. 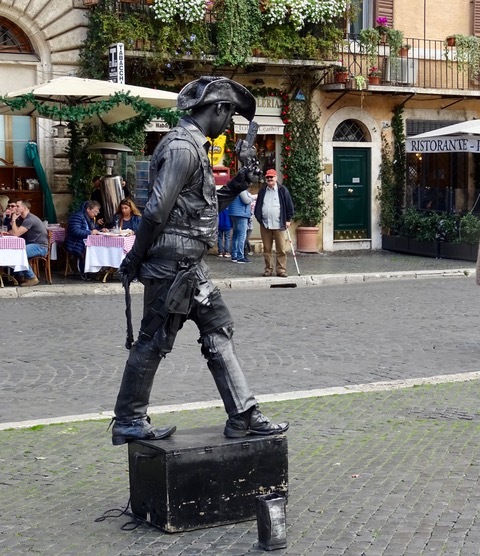 The studio is only a couple of blocks from the Piazza Navona. 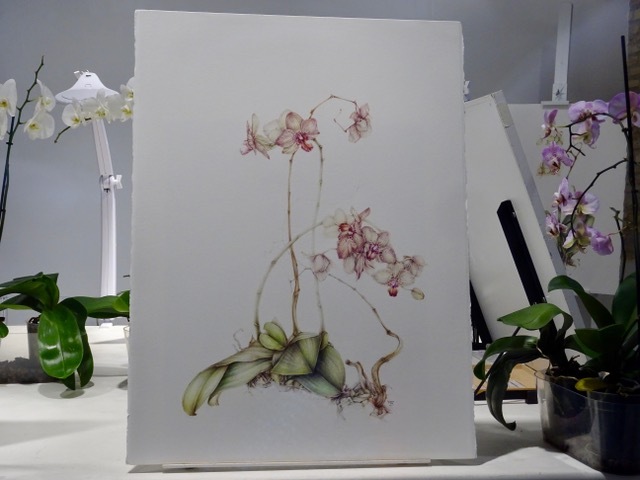 There is a little studio with beautiful watercolours of orchids on the way… and several basket and chair makers on the same street as the studio… along with a great little book store. 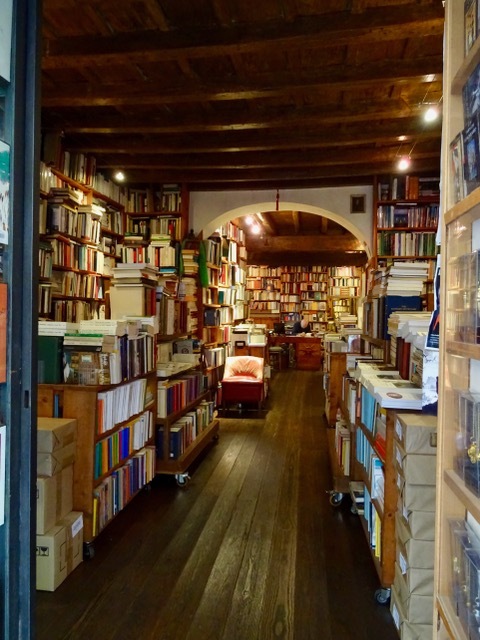 I love European bookstores, they are usually small, crowded, and piled with books on every available surface. Just what I think a bookshop should look like. We found the studio, I think we might have had trouble locating it in the dark later, so I am glad to know where I need to go tonight. 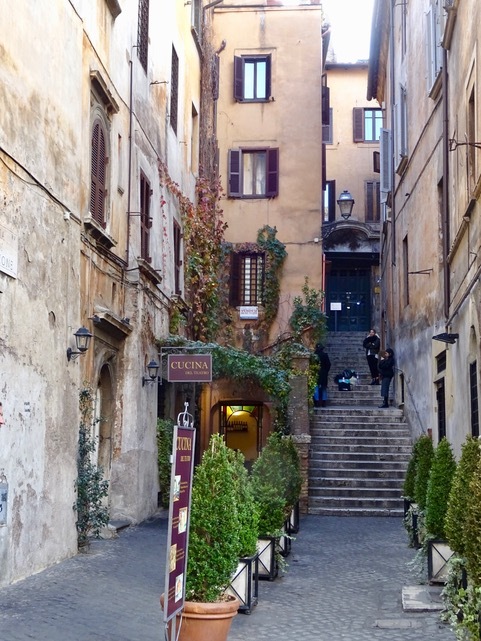 Heading back to Navona Piazza I peek down the side streets. I wish there was enough time to explore them all. There are people trying to make money whatever way they can. 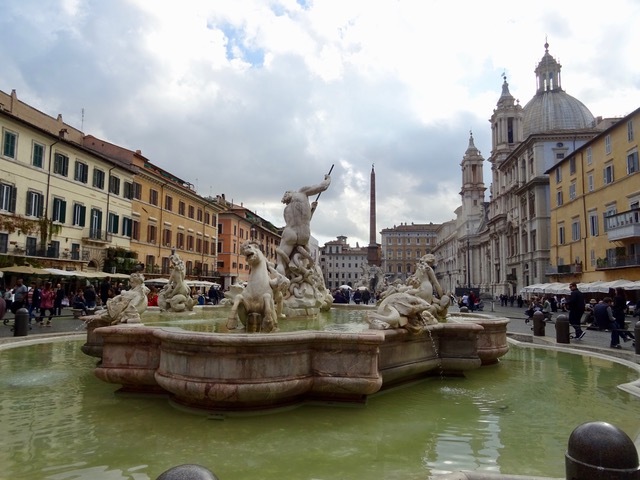 The Fountain of Neptune is at the northern end of the square. 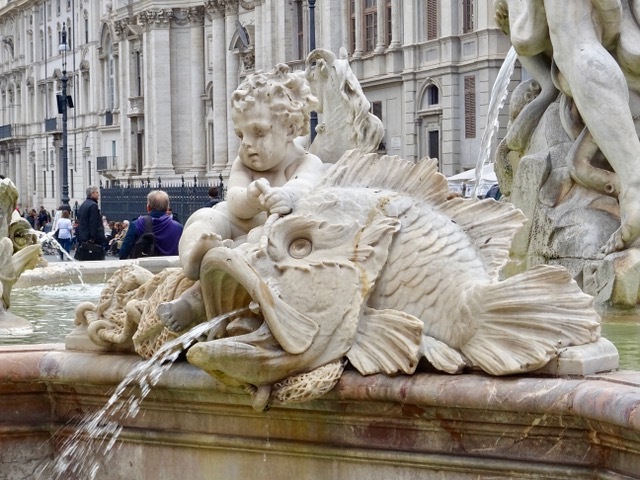 I really like this little fellow and his spouting fish on Neptune’s Fountain. 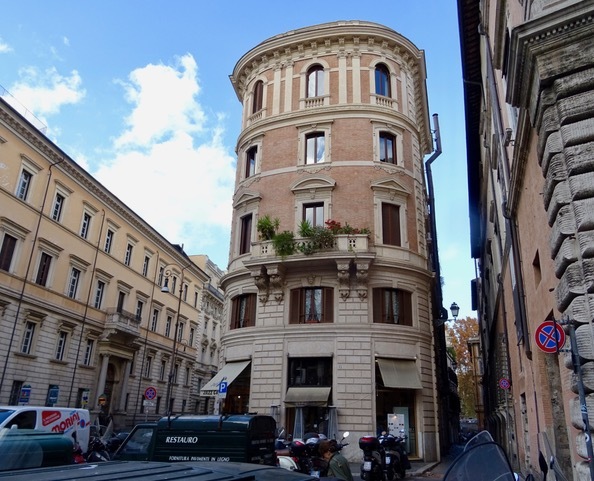 Buildings come in all sorts of interesting shapes and sizes in Rome.Tthis one appears to be right in the middle of the street! We wander about window shopping and see this robotic sculpture who waves his arms and blinks his shining eyes. 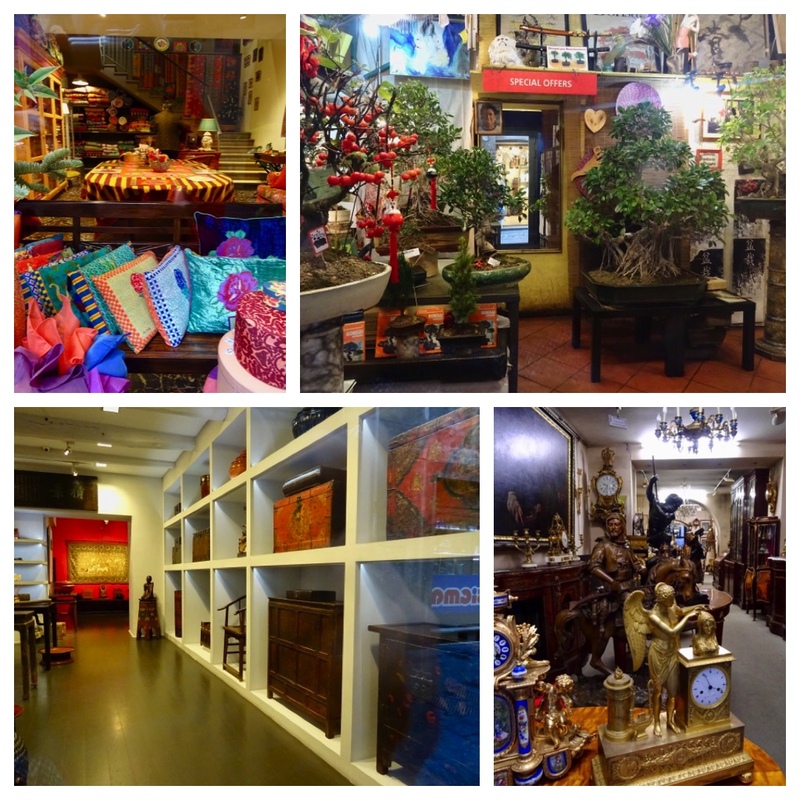 An interior decorating shop, a store that sells Bonsai trees, another that sells Oriental furniture and one of the many antique shops along the streets we walked. 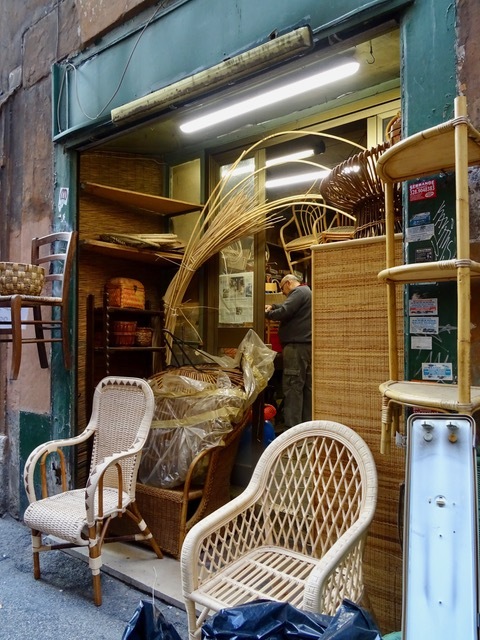 We never know what we might see down a side street. It is a bit of sensory overload at times. 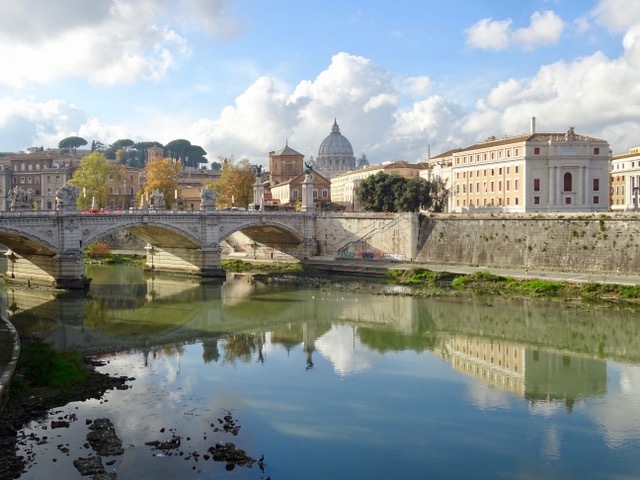 We turn the corner by the elementary school and this is what we see: the Tiber River with St. Peter’s in the background. 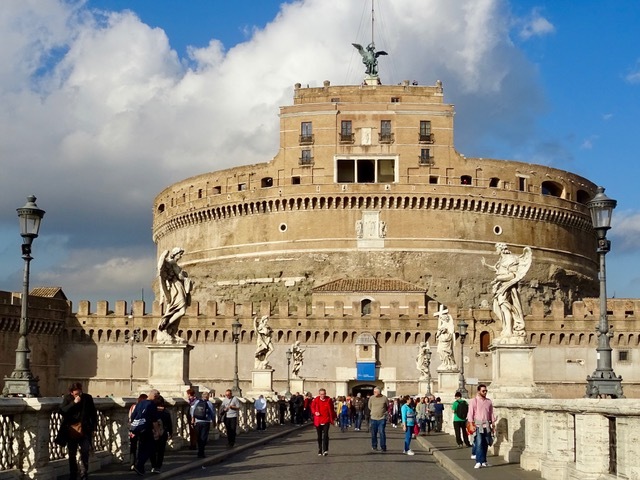 We cross the Ponte San Angelo… walking towards the Castel San Angelo, which is now a museum. There was or maybe still is a secret tunnel that connects the Vatican to this fort so that in times of danger the Pope could escape and hide here. 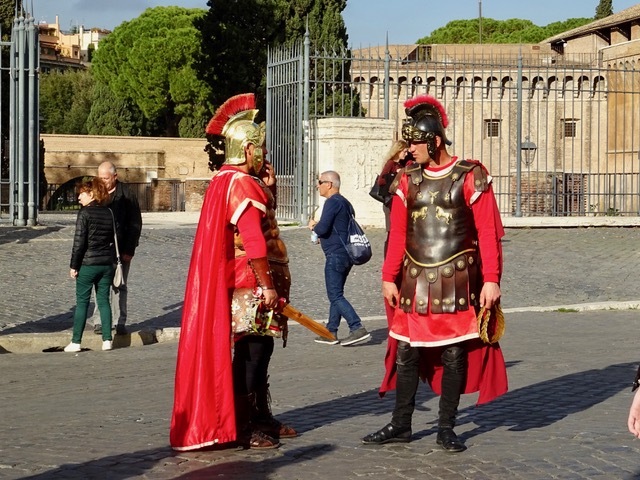 What would Rome be without gladiators? We head towards St. Peter’s hoping that we might have another visit to see the inside in the daytime. 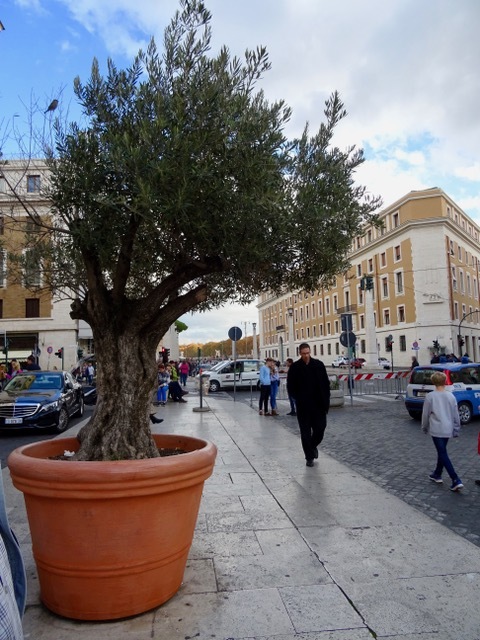 I have no idea how these olive trees manage to grow in pots, even though they are big pots. I wonder if they need their roots trimmed, like bonsai. 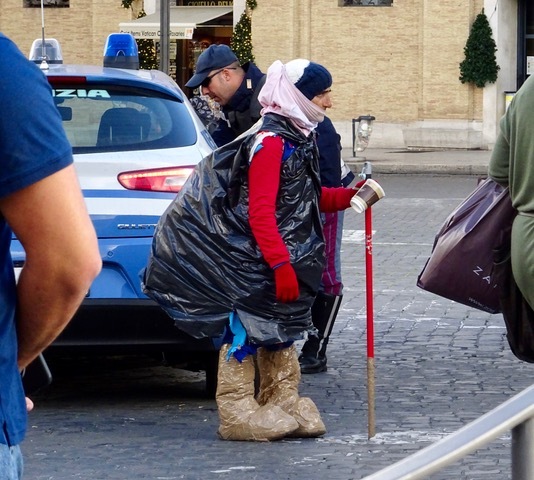 We have seen quite a few people begging on the streets, but this person was by far the strangest looking. I have no idea if this is a way of getting sympathy or if it is really the day to day garb of this individual. 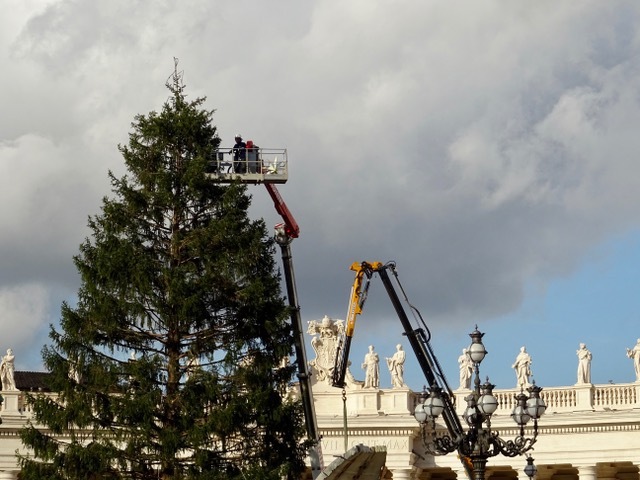 A Christmas tree is being decorated at St. Peter’s square. 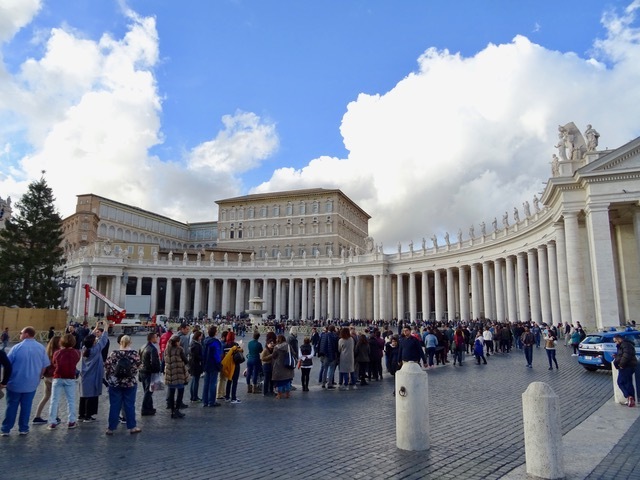 The line ups to get into the Basilica are very long so we decide to try to visit another day. This is just one of the benefits of spending more than a couple days in a city. We don’t have to try to cram everything into just a few days. I think these columns are magnificent. 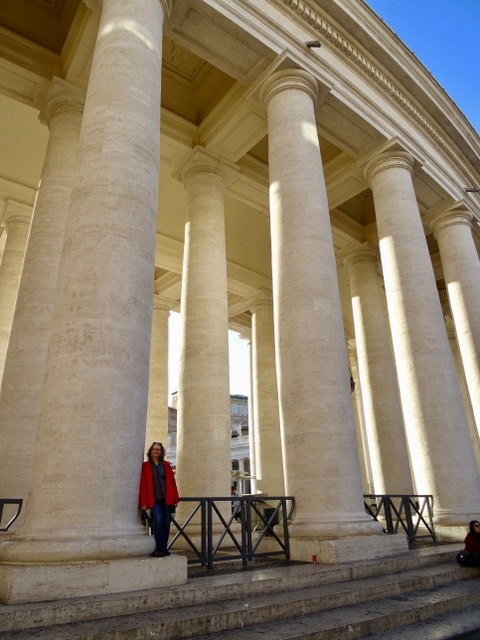 There are 284 columns and 88 pilasters (half columns) that flank the square in a colonnade of four rows. 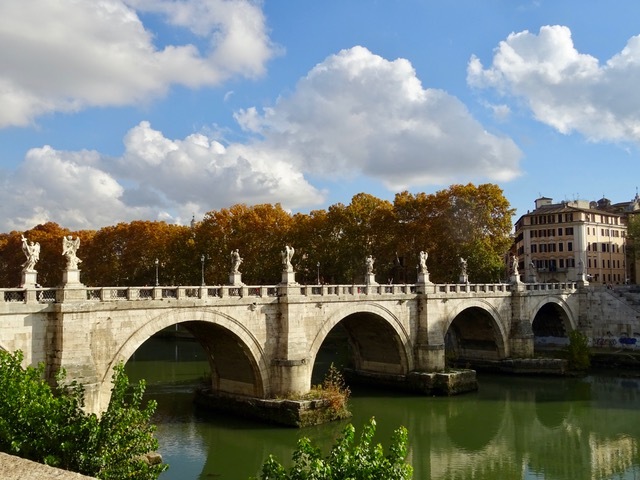 Above the columns there are 140 statues created in 1670 by the disciples of Bernini. 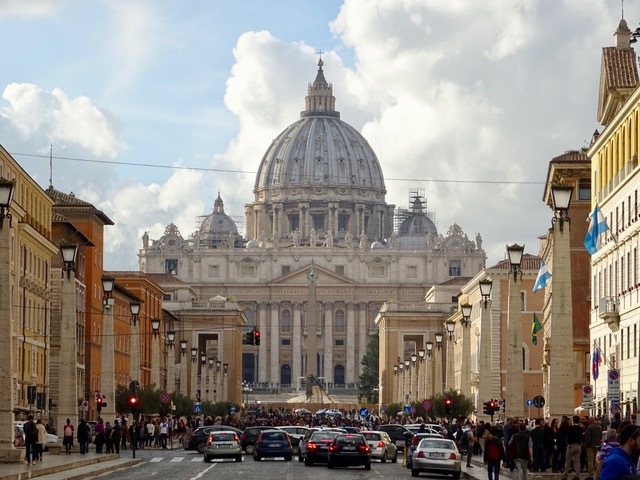 St. Peters square is one of the largest and most beautiful squares in the world. 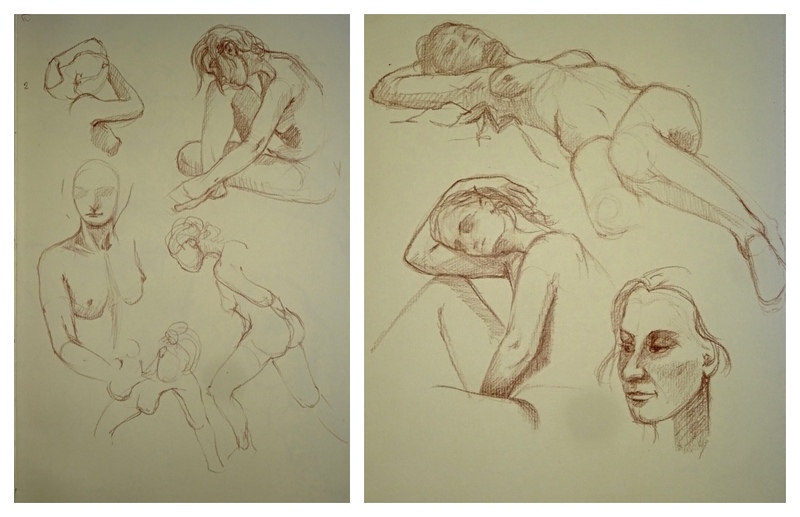 After a rest and supper at home we take the bus back to my life drawing session. While I draw for two hours Bob found a reception at a gallery that he ‘crashed’ and he enjoyed some wine and goodies. I had a great time drawing. 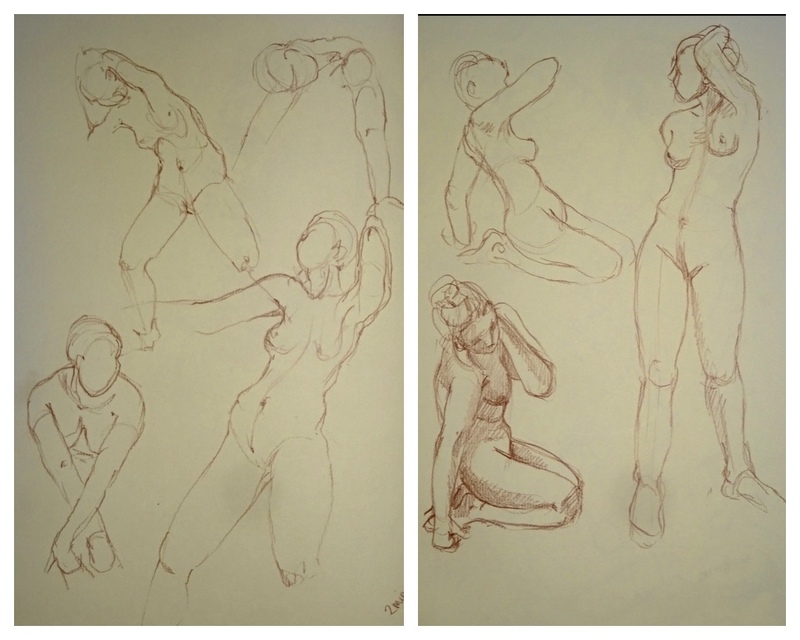 30 second and 1 minute poses Everyone was welcoming and the model was fantastic. I did all right, some not so bad and some not so good drawings. It has been a while since I have attended life sessions. It isn’t like I forget how to draw but it takes a while to get the facility back. I really appreciate the drop in sessions offered at home. Sessions are $8.00 for 3 hours. 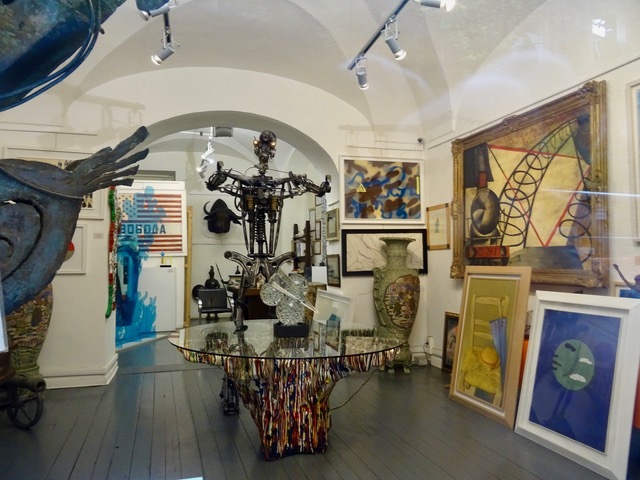 Here at La Porta Blu art School it was €15.00, or about $22.00 Canadian for two hours, which is about what I was paying when I was in Paris. 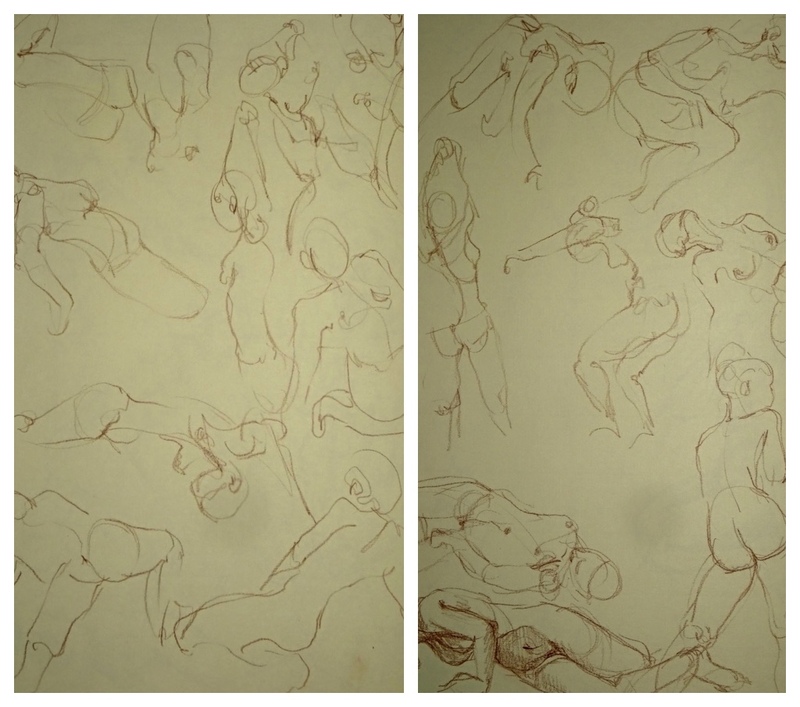 I did find one other place with drop in life drawing in Rome where but their price was €30.00 and €45.00 for 2 hours! That was just a bit too expensive for me. 2, 5,10 minute and 20 minute poses Unfortunately, the bus we were to take home was very late. We were just about to give up and try walking to the metro, which was a long way away, when our bus finally arrived, just 45 minutes late! We are in Rome after all, and schedules here have a slightly different connotation than they do at home. 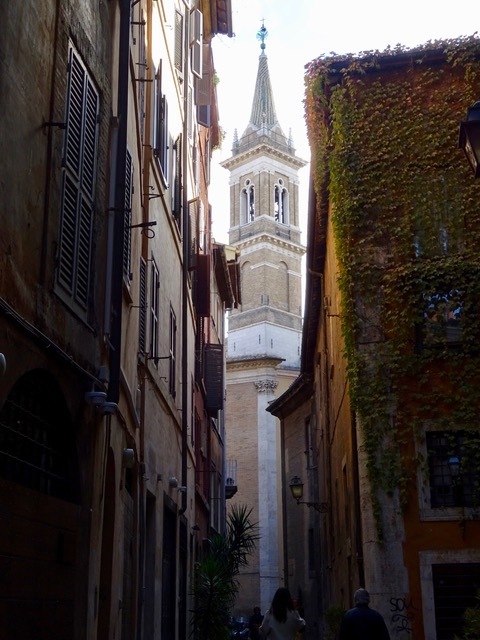 This entry was posted in Churches, Drawing, Historic Buildings, Italian Cathedrals, Italian towns, Italy, Life drawing, Rome, The Vatican, Uncategorized, Vacation and tagged Art, Cathedrals, Churches, drawing, Italian towns, Italy, Life drawing, sketches, The Vatican, Vacation by Trudy. Bookmark the permalink. The summertime flooding of the Nuovo Piazza into a lake is pretty unbelievable. Yeah. We saw some drawings of it flooded and it was pretty amazing. This was discontinued due to worries about spreading disease and illnesses.